Skirda, Alexandre and Efim Yarchuk. Kronstadt in the Russian Revolution . Kate Sharpley Library: 1994. 36 pages, large format. Translated by Paul Sharkey. 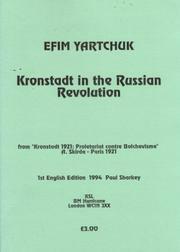 An account of Kronstadt's significance from the beginning of the Russian Revolution until the victory of the 'red' bureaucracy. 9781873605073 Not currently available. Find at a local library. KSL: Bulletin of the Kate Sharpley Library No. 1  .